RNA interference (RNAi) is a widely used technique in which double stranded RNA is exogenously introduced into an organism, causing knockdown of a target gene. In the nematode, C. elegans, RNAi is particularly easy and effective because it can be delivered simply by feeding the worms bacteria that express double stranded RNA (dsRNA) that is complementary to a gene of interest. First, this video will introduce the concept of RNA interference and explain how it causes targeted gene knockdown. Then, we will demonstrate a protocol for using RNAi in C. elegans, which includes preparation of the bacteria and RNAi worm plates, culturing of the worms, and how to assess the effects of RNAi on the worms. RNAi is frequently used to perform reverse genetic screens in order to reveal which genes are important to carry out specific biological processes. Furthermore, automated reverse genetic screens allow for the efficient knockdown and analysis of a large collection of genes. Lastly, RNAi is often used to study the development of C. elegans. Since its discovery, scientists have used RNAi to make tremendous progress on the understanding of many biological phenomena. JoVE Science Education Database. Biology I: yeast, Drosophila and C. elegans. RNAi in C. elegans. JoVE, Cambridge, MA, (2019). RNA interference, or RNAi, is a widely used technique in which double stranded RNA is introduced to an organism, resulting in targeted gene silencing. The Nobel winning discovery of RNA interference allowed researchers to silence any C. elegans gene in order to determine its function. We can induce RNAi in C. elegans by first preparing plates with E. coli that express target gene dsRNA, which the worms will eat. Then, 4th larval stage worms are transferred to the RNAi plates and allowed to lay eggs. At the desired stage of development the progeny are collected and scored for phenotypes. RNAi technology is frequently used in C. elegans to conduct reverse genetic screens, automated high throughput screens, and as a tool to study developmental processes. In this video, we will explain the concept of RNA interference, demonstrate how to use RNAi technique in C. elegans, and discuss how scientists are using RNAi as a tool to better understand widespread biological processes. Let’s begin by first showing you how RNA interference works. In the case of C. elegans, the worms are fed bacteria, which have been transformed with plasmids that code for double stranded RNA complementary to the gene you want to silence. 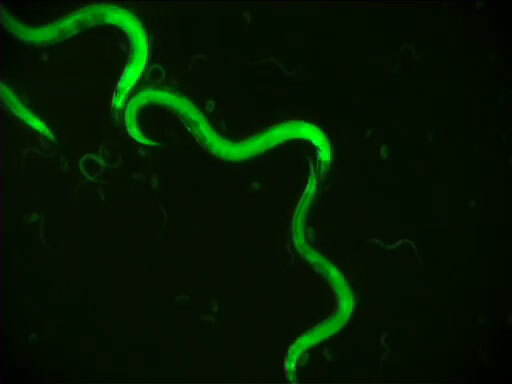 As mentioned previously, C. elegans will feed on the transformed bacteria. Through a currently unknown mechanism, dsRNA enters C. elegans tissue once ingested. Once inside the cell, the enzyme Dicer cleaves the double stranded RNA into short interfering RNA, or siRNA, which is between 21 and 23 nucleotides long. Next, the siRNA associates with the RNA induced silencing complex, also known as "RISC", and becomes unwound. Then, the siRNA/RISC complex binds the target mRNA via complementary base pairing. This leads to the degradation of the mRNA, thereby knocking down that gene. Before beginning the procedure, the bacteria expressing the double stranded RNA of interest need to be prepared. Libraries of bacteria that contain dsRNA-encoding plasmids for thousands of genes are commercially available. 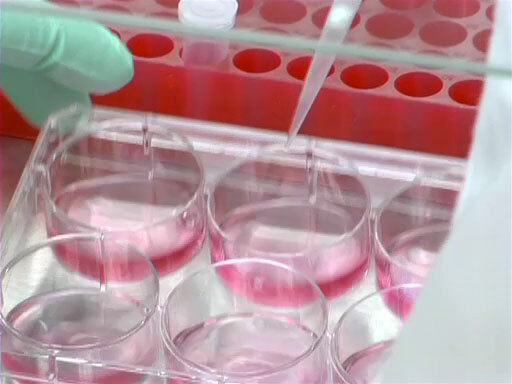 Otherwise, the target gene sequence needs to be cloned into a plasmid using standard cloning techniques. The plasmid contains a gene for resistance to the antibiotic ampicillin, which can be used to select for bacterial colonies that contain the plasmid. Next, use standard techniques to transform the plasmid encoding your dsRNA of interest into the (DE3) strain of E. coli bacteria that will express the double-stranded RNA. Also, transform the bacteria with an empty plasmid as a control. Importantly, the strain of E. coli used in these experiments lacks RNA polymerase III, which would otherwise digest double stranded RNA. This bacteria also contains an IPTG inducible gene for T7 DNA polymerase, which transcribes the dsRNA in the plasmid. Lastly, the bacteria (DE3) are both tetracycline and carbenicillin resistant, to maintain RNA polymerase III expression and prevent unwanted bacterial growth. Spread the transformed HT115(DE3) bacteria on LB agar plates containing 12.5 μg/ml tetracycline and 25 μg/ml carbenicillin. Incubate overnight at 37 °C and the next morning bacterial colonies will be present on the plates. Then, select a single bacteria colony, and add it to 1 ml of LB broth containing 100 μg/ml of ampicillin to select for bacteria containing the plasmid. Incubate overnight at 37 °C with agitation. After the overnight incubation, add 5 ml of LB broth containing 100 μg/ml of ampicillin to the culture, and incubate for an additional 4-6 hours at 37 °C. Once the bacteria are ready, RNAi worm plates need to be prepared for feeding. RNAi worm plates contain: agar, water, carbenicillin, Worm medium mix, and IPTG to induce the T7 DNA polymerase in the bacteria that transcribes the dsRNA in the plasmid. Add 0.5 ml of bacteria culture to RNAi worm plates and incubate overnight at 37 °C, creating a bacterial lawn. Before adding worms to the RNAi plates, it is important to synchronize the developmental stage of the worm, so that any observed differences in phenotype are not an artifact of the developmental stage. In order to synchronize the developmental stages, first flame-sterilize a platinum wire pick. Use the worm pick to add L4 worms to each RNAi plate, and incubate overnight at 20 °C, allowing them to become young egg laying adults. Next, transfer young adults to new RNAi plate and incubate for 6-8 hours at 20 °C, during which eggs are laid. Once all the adults are removed, these eggs will be developmentally synchronized. Finally, allow worms to grow on RNAi plates until they have reached the developmental stage of interest for analysis. In order to visualize the worms, a slide must be prepared with a 4% agar pad. First, tape 2 glass slides with labeling tape, creating spacers which ensure uniform thickness of the agar pad. Place a clean glass slide between the two spacers and pipet about 150 μl of 4% molten agar onto the slide. Quickly cover the molten agar with additional slide perpendicular to the spacers. Gently separate the slides and the agar pad will be adhered to one of the slides. Next, add 10 μl of an anesthetic such as sodium azide to the agar pad to immobilize the animals. Using a platinum wire pick, transfer worms to the agar pad with anesthetic and add a cover slip. Finally, observe worms under a microscope. Compare worms who have had RNAi gene knockdown with controls, and note differences in size, developmental stage, morphology, localization patterns of fluorescently tagged proteins, and other potential phenotypes. One of the most valuable applications of RNA interference is the ability to easily perform reverse genetic screens. A reverse genetic screen is an approach to discover gene function by knocking down a known collection of genes and assessing the phenotypic result. For example, researchers can use a library of bacteria that express dsRNA for nearly all the genes in the C. elegans genome. These bacteria are cultured on multi-well plates and fed to the worms. Then, the phenotypic effects of the RNAi knockdown of many genes can be assessed, giving insight into the normal in vivo gene functions. Automated genetic screens are a type of reverse genetic screen that are extremely high throughput. 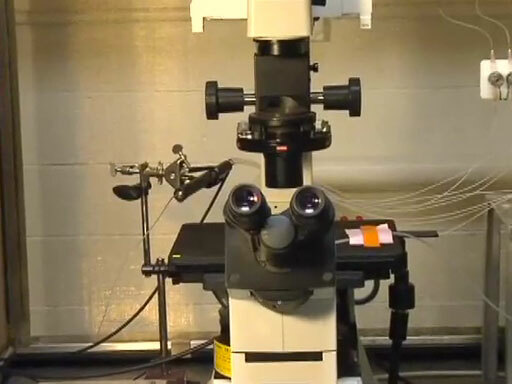 In automated genetic screens, the entire C. elegans genome can be knocked down very easily by using robotic handling of the thousands of bacterial clones, and using specialized instruments for quantitative analysis. For example, worms expressing a transgenic fluorescent reporter for the anti-microbial peptide gene nlp 29, are subject to RNAi knockdown of thousands of genes via bacterial feeding. At the same time, the worms are introduced to fungal spores. Then, the anti-microbial peptide response to fungus can be assessed. 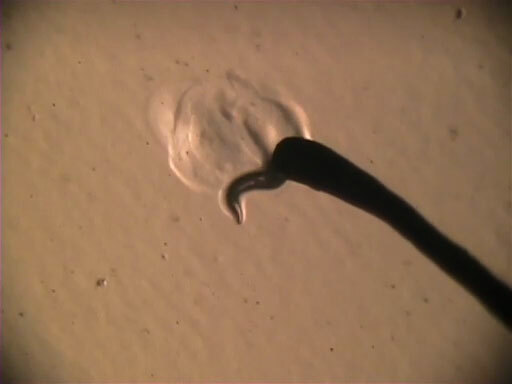 C. elegans development is frequently studied using RNAi. Scientists can use RNA interference to knock down any gene (or collection of genes) of interest and assess exactly how that gene affects processes during development and/or developmental timing. For example, RNAi knockdown may reveal genes that delay development when knocked down, or genes involved in organ development. You’ve just watched JOVE’s introduction to RNA interference in C. elegans. We reviewed how RNA interference works and how to use RNA interference in C. elegans via bacterial feeding. RNA interference is a valuable tool for reverse genetic screens, including automated high throughput screens, and is also a useful tool for studying development. Thanks for watching!